GET OUR BACKPACKS READY, as it won’t be long! 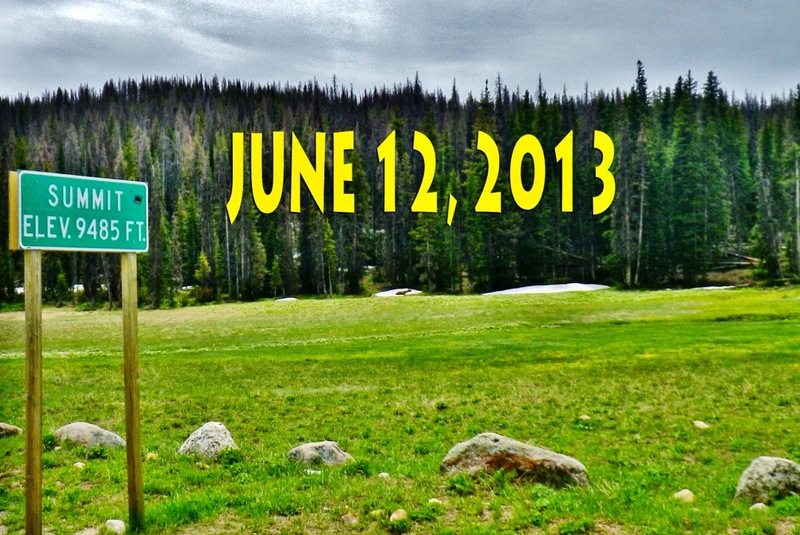 Just receivcd a report that the road to the Grandview Trailhead is now OPEN! But there is still a lot of snow above 9,500 ft. 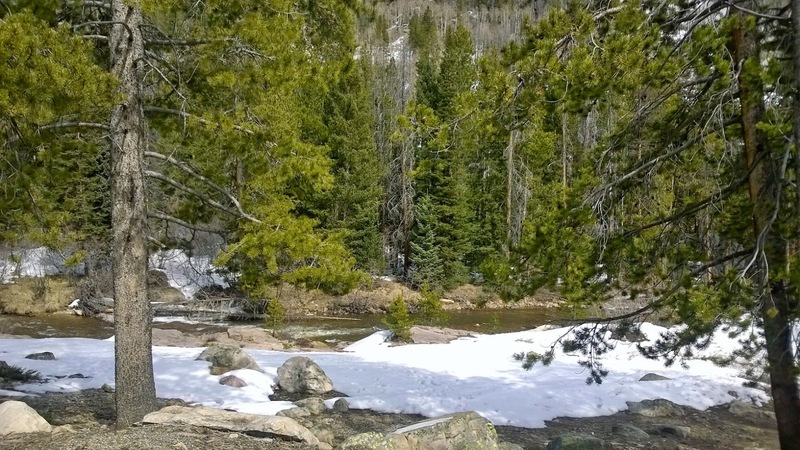 NOTE: Someone from the Forest Service tried to get to the Grandaddies via the Rock Creek Trailhead, and reported streams running high, and at around 9,500 ft. they ran into 2.5 ft. of snow, and gave up. As far as the Forest Service knows, NO ONE HAS GOT TO THE GRANDADDIES YET! 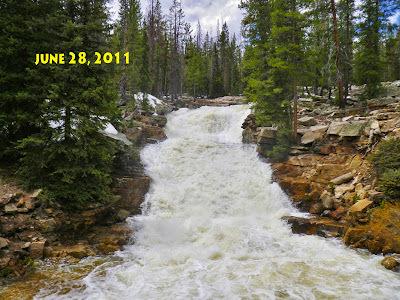 JUNE 11 UPDATE: Just advised that Wilderness Rangers are working on the trail to the Grandaddies and it is passable. 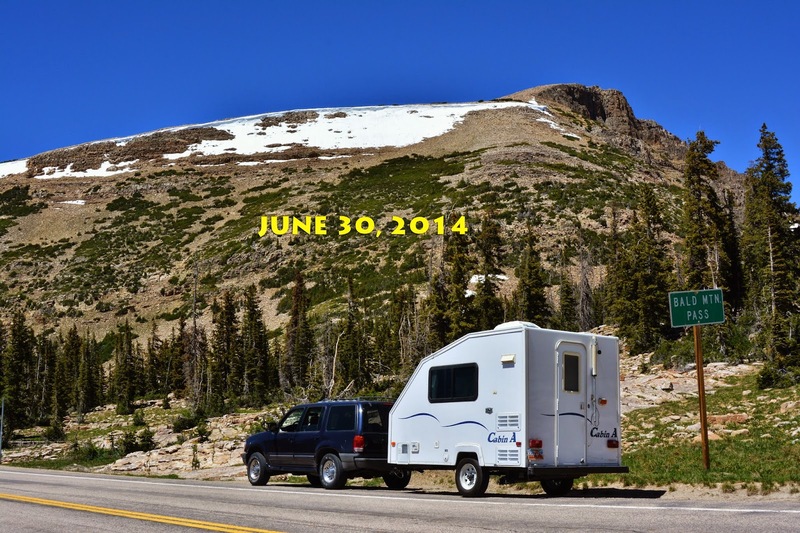 The Forest Service informed me today that roads to most of the trailheads are open, but still too much snow up in the high country….so trails are quite difficult above 9,500 ft..but with the warm weather, it won’t be long! Some friends right now are going in to RedCastle using snowshoes! I’ll keep you informed until June 6th when I will head for Bald Mt. Pass to acclimatize myself for my first backpack. For Grandaddy, Rock Creek, Yellowstone Creek, Uinta River Trails. JUNE 6th, nothing new except that the further east you go there is less snow. Will keep watching and report until I’m gone into the high country. State Highway 150: The Mirror Lake Scenic Byway…..OPENED Tuesday, May 19th! NOTE: Warming trend…but no nightime freezing…Forecast below. Snow depth 37″ on April 26th…….and down as low as 23.5″ but since up. today, June11th at 04:00 PM at 0.10″ temperature today is 48 degrees & not freezing at night. …….updated here daily so we’ll know when we can get our backpacks ready. ……is upon us…finally… so we can start backpacking soon! This is a critical problem for Utah as 90% of all of our water comes from the High Uinta Mountain range. On the northwestern end of the range the Bear River flows north into Wyoming, then swings through Idaho and makes a U-turn south flowing back into Utah and the Great Salt Lake, its 500 mile length making it the longest river in the hemisphere that doesn’t empty into an ocean. All the other streams on the North Slope (Blacks, Smiths, and Henry Forks, and others, are tributaries of the Green River that forms Flaming Gorge Reservoir, then joins the Colorado flowing south to Lake Powell and further south to Lake Mead–all of it a critical system for the West. On the Northwestern end also flows the Weber River emptying into the Great Salt Lake, as does the Provo River on the southwestern end of the range. The other rivers and creeks on the South Slope flow into the Green River, after providing water for the farms and communities in the Uintah Basin. So, for Utah, and for lovers of the outdoors, like us backpackers, and others, the snow pack that accumulates in the winter, and then thaws, is crucial to keep our eyes on. The measuring stick that tells us how the backpacking season is going to be, and when it will start, are the two paved highways that cross the northwestern and the southwestern portion. These “measuring sticks,” their openings after a long winter of being closed, tell the tale. 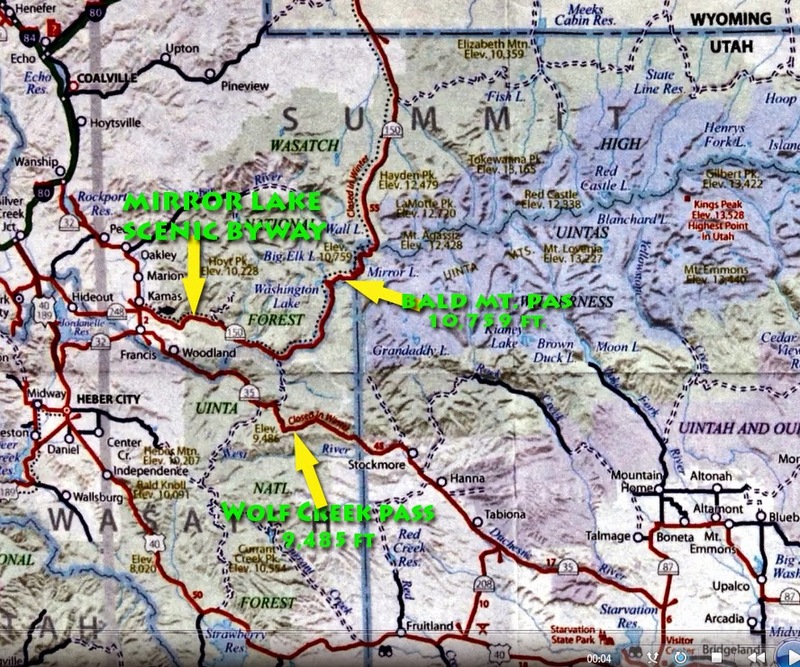 A road map of the western Uintas as seen below highlights the two, which are: (1.) 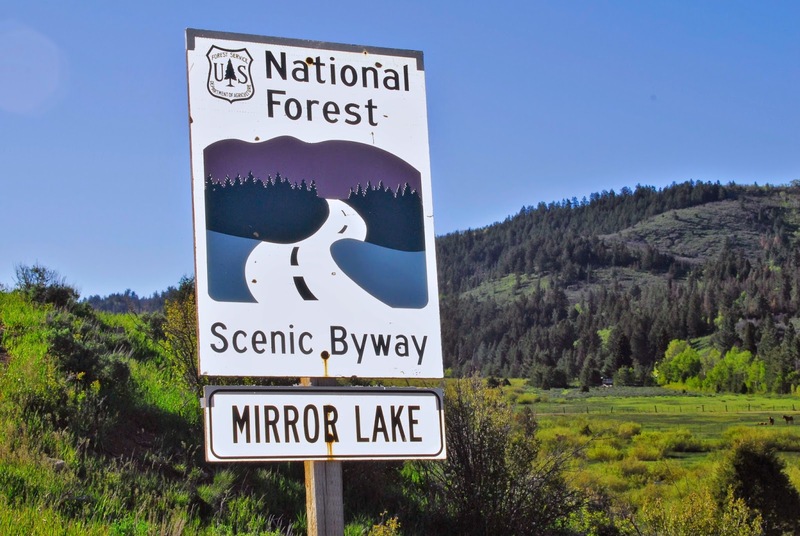 From Kamas, State Highway 150, called the Mirror Lake Scenic Byway, which heads east and then swings to the north over 10,759 ft. high Bald Mountain Pass, and continues north to Evanston, Wyoming; (2.) 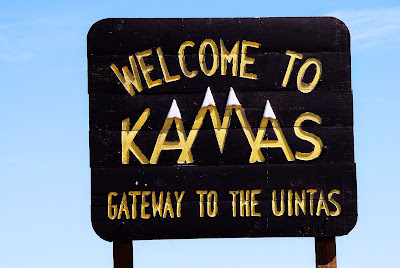 State Highway 35 that takes off 2 miles south of Kamas, at Francis, and climbs east over 9,485 ft. high Wolf Creek Pass, then goes down to the North Fork of the Duchesne River, and Hanna, Tabiona, then continuing on to Duchesne. 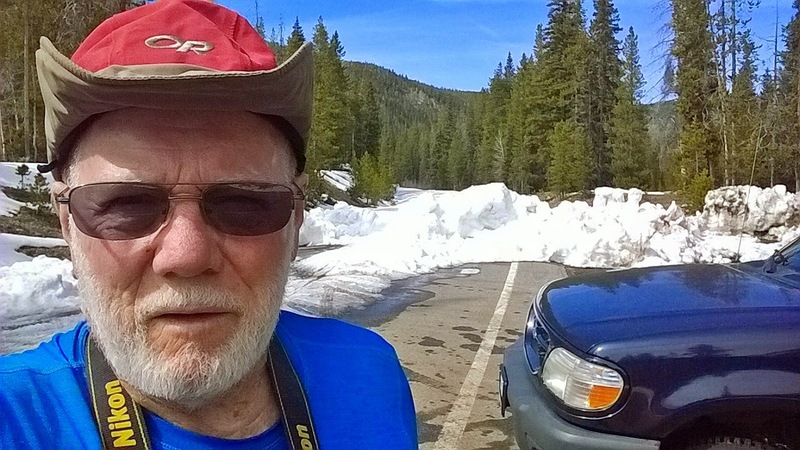 Early this week–March 30th to April 4th, I was shocked to learn from my buddy, Ted Packard, that the Wolf Creek Pass was reported open in the Salt Lake Tribune, opening on Monday, March 30th! I got organized and spent my Saturday checking that out, as well as the North Fork of the Duchesne River, Hades Canyon–GATEWAY TO THE GRANDADDIES, and then back over to Kamas and the Mirror Lake Scenic Byway. Of course I took a few photographs which I’ll share with you now, as well as showing the snowfall and opening history of the two areas from past years. We begin climbing the hill from Highway 40, north of Heber, up above Jordanelle Reservoir which we see is very low, with basically no run-off coming into it from the Provo River. From there we look east over dry, snow-free hills and see the High Uintas looming in the background, with some snow, but not very much. 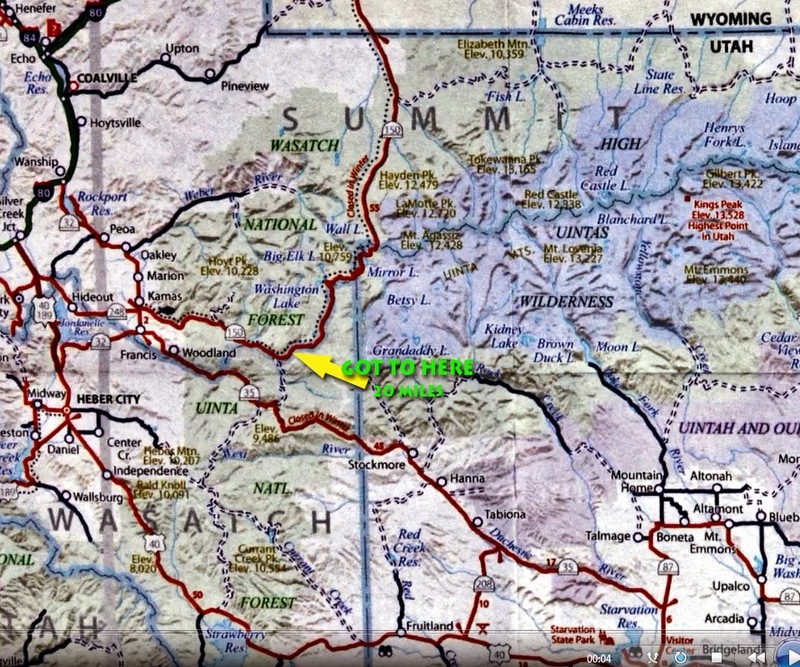 I’ll insert the map again, below, showing the first lap of the exploration on the southern side, heading from Francis east on Highway 35 towards Wolf Creek Pass the distance being 20 miles. Twelve miles from Francis you come to a large parking lot and rest area with restrooms, called Nobletts Trailhead, and find the sign you see below. On the northern slopes there is snow. The southern slopes are most bare. Nearby are the signs to Tabiona and Duchesne. We are coming to the pass where a dirt road takes off to the south, but of course snowed in still. Yes, there is still snow, but remember we are talking about April 4th, easily the earliest opening of the highway in memory. Now we begin comparing with previous years, dates inserted in the photos. Remember we will be comparing these previous totals with April 4th, 2015. The above photo nearly 3 months later. Of course on April 4, 2011, I would have only been able to get to this spot using a snowmobile. For correct comparisons I will try this year to get photographs of the spots on this report on the same dates. The difference will be incredible. The above photograph was taken about two weeks earlier than the previous one, with basically no snow left, so each year obviously varies some, but never as extreme as it will be this year. So below is the view on April 4, 2015…last Saturday, 2 to 3 months earlier than the previous two pictures. I of course had company, including quite a few cyclists you see approaching in the background. Now we will head down to the east towards Hanna. I insert the map again so you can remember where we are heading….with a new arrow pointing to our next destination, the North Fork of the Duchesne River. We begin to really get concerned after dropping down 3,000 ft. and ready to cross the river and turn to the left up the canyon….“concerned” because the mountain sides are bare of snow and dry! Before heading up the canyon, here’s a view of the ranching country just a mile or so down the road toward Hanna (5 miles distant). The High Uintas are seen rising up, again with little snow until you get to the very highest peaks in the background….so future runoff in the next couple of months will be very little, if any at all. Above we see the North Fork of the Duchesne River on April 4, 2015….last Saturday!. 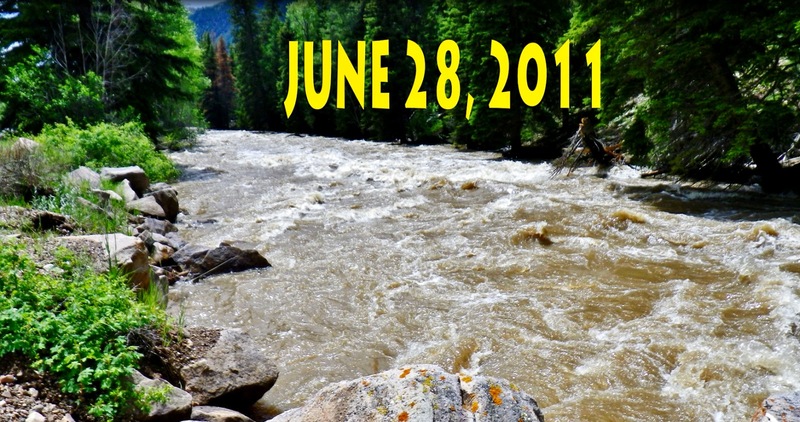 If you didn’t know any better, you maybe wouldn’t be concerned, but look below how the river was nearly 3 months later in 2011 when there was a runoff–which I must add was a record runoff. 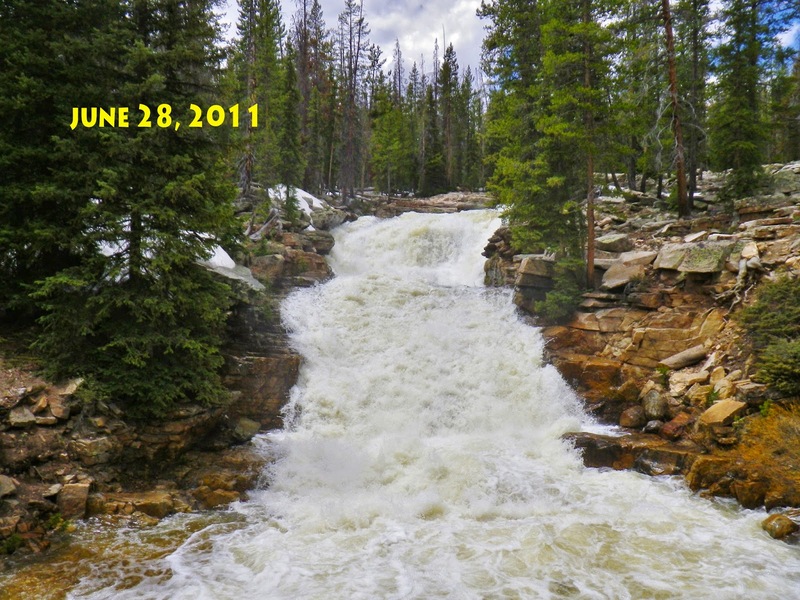 Below is a shot of the river 9 weeks after the April 4th view I’ll insert again below so you can compare. The river is obviously very low already, with basically no runoff pending, so it can be expected to get lower as the summer arrives. Now we continue up the canyon, the paved road now behind us and approaching Defa’s Dude Ranch. Once again, almost no snow is visible. From the same spot of the canyon photograph, we look east, now approaching Hades Canyon you see in the photograph below. For those who aren’t familiar with the area, Hades Canyon leads to the Grandaddy Basin, one of the cherished destinations of many who love the Uintas. Back in 1952 we had to begin our hike at the bottom and hike 10 miles to Hades Pass. Now there is a road that takes you to the Grandview Trailhead, from which it is only 4 miles to Grandaddy Lake, and the Basin that has 26 lakes, some remote and off-trail, all full of feisty Native cutthroat,and Eastern brook trout, and Arctic grayling. Zooming in just a bit we see the road cut going up the side of the canyon with the lookout on the top left where you can look down on the trail climbing Lightning Ridge….some of my sweat and blood maybe still staining the trail from from my first backpack in 1952 when we hiked all night to get to the Grandaddies for the Fish Opener on the 1st Saturday in July. Today, there is basically no snow, and I began getting excited thinking that the road would incredibly be open and on April 4th I could be at the Trailhead! We soon drive by Defa’s Dude Ranch, but all is quiet and not open yet. So, apparently the well-known Saloon isn’t jumping yet on the weekends as it is during the summer season. It probably won’t be too long before they warm things up. A little further up the road we come to the turn-off to the Grandview Trailhead, and turn off, heart pounding hoping the gate will be open. Of course, no such luck. Just around the turn I could see the gate closed. But, the way things are looking, I bet the road will be open and it will be possible to do my first backpack of the season into the Granddaddies in early May….which has never happened in my experience. 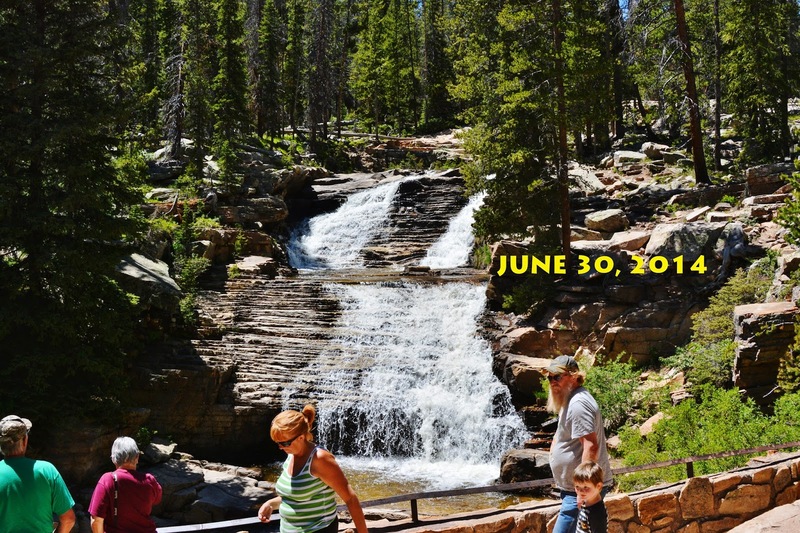 IT WILL BE HIGH UINTA SPRING BACKPACKING! UPDATING: The Duchesne Forest Service Ranger Station just reported that by April 20th there will be an updating of accessibility to the Grandview Trailhead up Hades Canyon. So back down the canyon to the highway and we’ll now backtrack up over the pass, and down to Francis and on to Kamas and get on the Mirror Lake Scenic Byway . Once again, to remind us, here’s the map…..showing that we’ll head for Kamas and explore Highway 150. ……and it says it is closed, but the gate is open and the road clear, with signs that cars have kept climbing towards Bald Mountain Pass…..so off I go too. Soon spotty patches of snow are on the highway….obviously a lot of traffic packing it down. 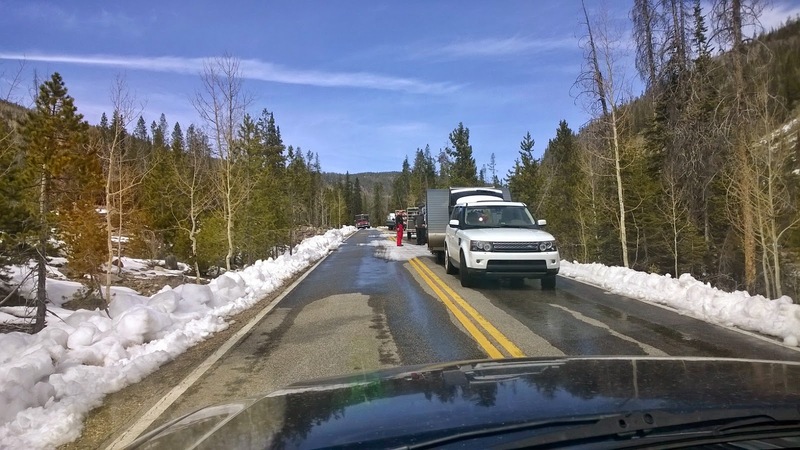 We come to the end of the passable road, with vehicles loaded with snowmobiles parked or loading up……….. There was a spot carved out so vehicles with trailers could turn around. To this point it is about 20.5 miles from Kamas, approximately about half-way to Bald Mountain Pass and the Mirror Lake area, as indicated below on the map. I suspect that soon, at least by the end of April, the road will be open all the way. 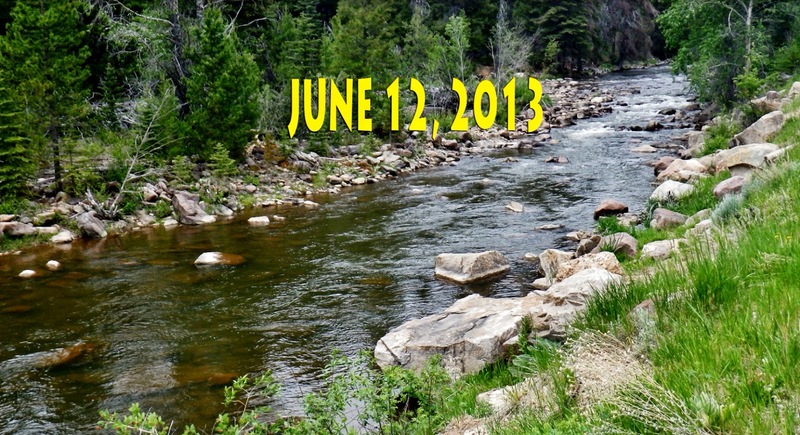 I’ll call the Forest Service in Kamas to check on this, and insert here what I learn….but it will be incredibly early. UPDATING: Monday, April 6, 2015. I just talked to the Forest Service in Kamas and they report that no firm date has yet been set for the opening of the Byway. I will keep in touch with them and report any decisions….and I hope to be behind the snowplows as they clear the highway over Bald Mt. Pass and on to Wyoming….of course coming from Wyoming the road is open all winter to the turn-off to the North Slope Road just past the Bear River Resort. Looking to the east, we see through the trees the western facing slopes that have little snow. Those facing south have none. Below, looking down at the Provo River that shows no run-off, just like a small creek. Following are photographs up on Bald Mountain Pass, and down towards Mirror lake, indicating when in those years the road was open to traffic. Like I say, I suspect it will be open before the end of April. Last year, 2014, it was open on May 28th. As I have said, later on the dates indicated I will do my best to get to these areas and take photographs so we can compare one year against another, and have a better idea what to expect during the summer of 2015. 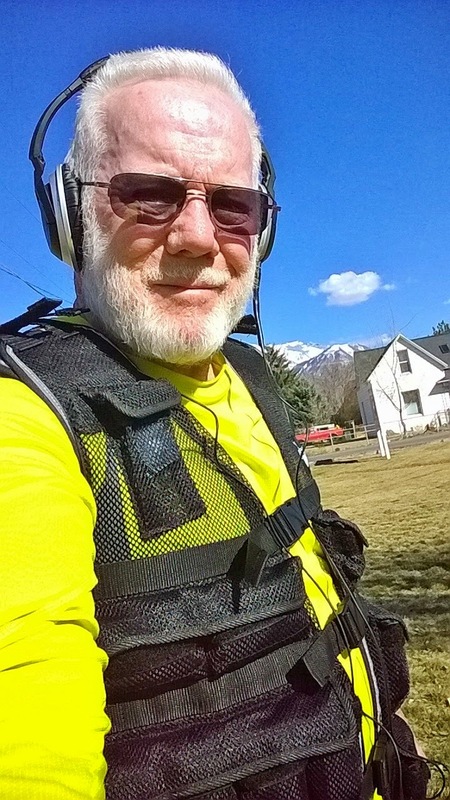 I’ll be in touch, and of course be working out daily with 40 pounds on my back–one day my new weighted vest, then alternate with my backpack–with weight distribution a bit different — so that in my 80th year, the summer of 2015, I’ll begin what I expect to be the best backpacking season of my life…..
……the 1st trip projected to be 5-7 days in the Grandadday Basin–fishing in & photographing 16 alpine lakes–catching native cutthroat trout , eastern brook trout & arctic grayling. A couple of the lakes off-trail never visited before, a few not visited in 60 years and never photographed, and others just because of their incredible beauty and the love affair I have had with them and the High Uintas Wilderness for more than half a century. Then I will proceed with some crucial backpacks to exotic and remote areas crucial to bring my High Uintas Wilderness Project to a close. The MIRROR LAKE SCENIC BYWAY opened on Tuesday, May 19th, but I was working and couldn’t make the following trip until Thursday, May 21st. You’ll see conditions–for your MEMORIAL WEEKEND DRIVE, around 30 photographs including some unique ones of wildlife along the highway. The link to Accessibility from early April will also have this report tacked on the end, so if you haven’t seen that you might be interested in seeing that, with this one continuing there & get the history from April 6th to today. THE TRIP Thursday, May 21st. We start again at the overlook of Jordanelle Reservoir. We can see the water level is up from when the first report was made in early April after a very dry Winter, but followed lately by a wet Spring….which might save us! From the overlook we see the High Uintas looming to the east. 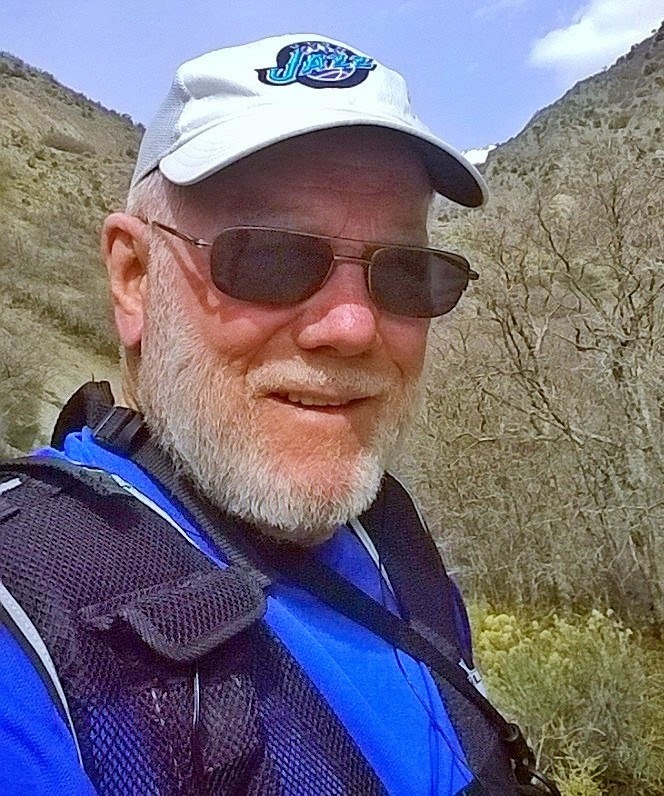 I started in American Fork, making it 48 miles to Kamas…one of the Gateways to the High Uintas. I had to use capitals to honor my backpacking buddy TED PACKARD. She I believe is from Oregon or Washington, and here to go to work in the Uintas….but like the rest of us, will have to wait and keep busy in the office for a while. Drive carefully as deer, and even moose cross the highway. Driving slowly you’ll also see many beauties of nature those in a hurry miss. Night time is especially dangerous with deer and moose crossing the road. We are here between 8,000 and 9,000 feet, with nature coming alive. We are here about 20 miles from Kamas and at the point where snow blocked the highway in my previous report on April 6th. At about 24 miles from Kamas we come to the Provo River Falls, and stop for a picture to compare with river flow in past years. 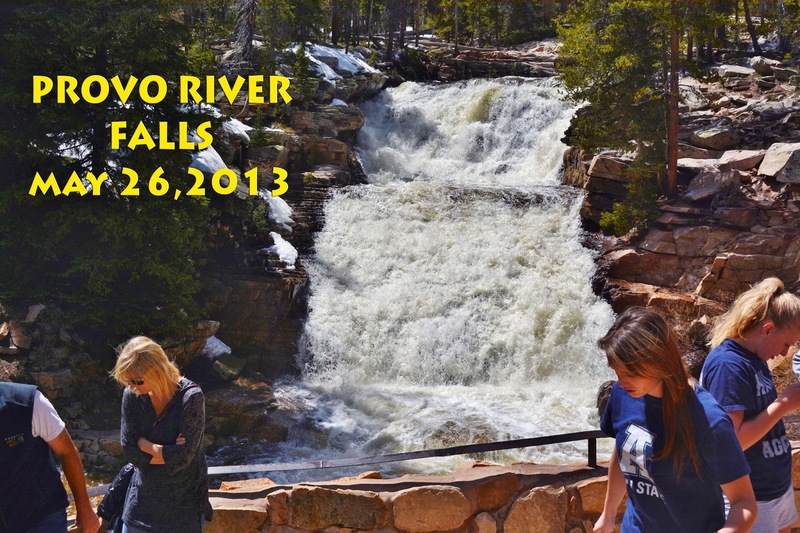 The river flow is way up from what it must have been on April 6th, and with the increased snow fall there will be more run-off than expected back in April. I’ll insert a few shots from previous years for those interested in making comparisons. Up the highway a few miles I had to get out of the way of a snow plow that was cleaning up the edges, and then pulled in behind him to the pass. As you can see this first lake along the highway is still frozen over, but slushy. 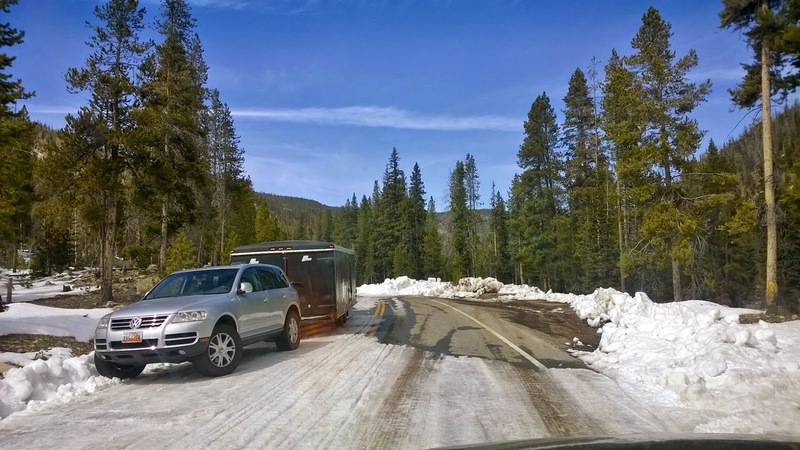 We already went by the turn-off to the Trial Lake, and Crystal Lake Trailhead, still with slushy ice, but it won’t be long….depending on the weather. 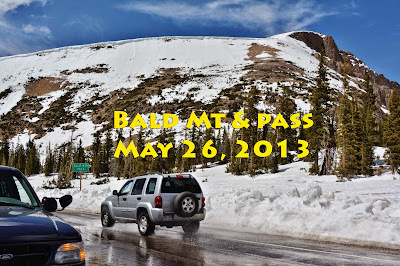 At Bald Mountain Pass we see the weather station that transmits daily the temperatures and snow depth…which I update on my website every day or every other day. This morning, snow depth here was listed as 44.9 inches, with 6 inches of new snow, but by right now reported as 41.8 inches. 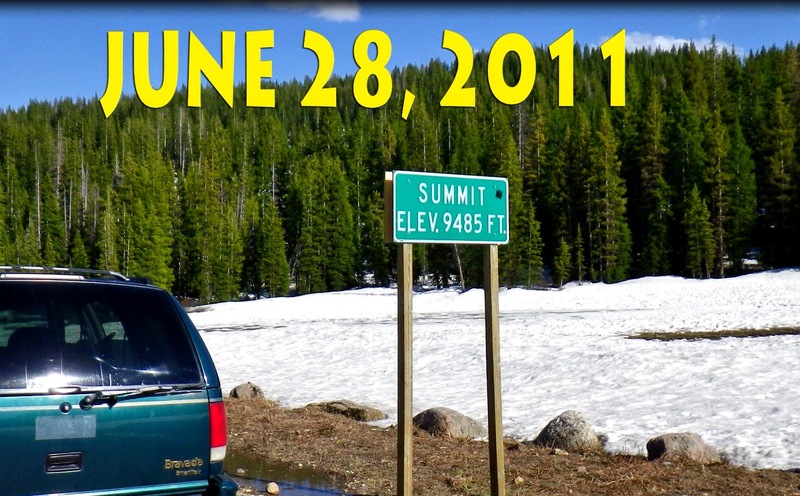 You can compare this with snow depths at this spot in previous years–but at much later dates. From Kamas it was about 29 miles to the pass. Once again I’ll insert photos from previous years, as close as possible to the date of this report, but usually it has never been open this early. You’ve already noticed that it varies a lot, but usually they try and have the highway open for MEMORIAL DAY, which this year worked. We are now heading down towards the entrance to Mirror Lake which is still frozen over. Mt. Agassiz and Hayden Peaks are hidden by clouds. We now view Hayden Peak as we climb up to Hayden Pass and the entrance to the Highline Trailhead. Butterfly Lake is on the left. We see here the entrance to the famous HIGHLINE TRAILHEAD…..the sign is there somewhere, totally burried by snow. It will be a while before we can head down that trail! Here’s just one shot from a previous year. We have turned around to head back viewing here Mt. Baldy (officially, Bald Mountain), and Reids Peak. Ahead I could see a medium sized animal crossing the highway and was climbing up a snowy slope to get into the rocks. Of course I screeched to a halt! Turned the motor, and radio off and waited with camera ready. All of a sudden a head popped up through the snow. With a little patience, he finally exposed himself. It was a beautiful Yellow Bellied Marmot, out of his hibernation, likely due to the winter that was quickly disappearing back in April. I was going to continue my photography, but all of a sudden a snow plow roared up behind me and I moved quick, heading on down the highway. Down in the lower country I stopped for a bit of lunch at a point where there are many beaver dams, hoping to get some shots of these incredible “engineers of the mammal world,” but rather all of a sudden heard a loud squawking…..
….and got a few shots of a couple of beautiful Sand hill Cranes. WHERE’S THE “GLOBAL WARMING” WHEN WE NEED IT? I’m raring to go with my brand new, revolutionary OSPREY ATMOS 65 backpack with a suspension system that is incredible they are calling “anti-gravity” and it really does feel almost weightless as it wraps around your back with even contact everywhere, total ventilation, and doesn’t even feel like it’s there! Looks kind of lumpy, as it only has in it my basic pack equipment: Sleeping quilt, air mattress, tent, poncho, rain parka, gravity water purification system, cooking items & fire making stuff, including new lightweight stove, SPOT Tracker, & fishing equipment, only coming to 15 lbs. Still have to add my sat phone, emergency & toiletries bag, extra clothes, food and water…..
…….and oh, I almost forgot, my new photography waist pack fully loaded that weighs 11 pounds!!! That includes my tripod that weighs more than my tent, and special wide angle lens that weighs as much as sleeping quilt & air mattress combined! Maybe for my longer backpacks…. I’ll have to get serious and just go with my tiny waterproof point and shoot camera that weighs less than my SPOT Tracker. Next week I’ll update my GEAR/SUPPLEMENT section with all the new stuff, as well as my ANTI-AGING article and links to all the stuff that keeps me going in my 80th year. So, I’m ready to go, but not by June 4-11th as originally scheduled. 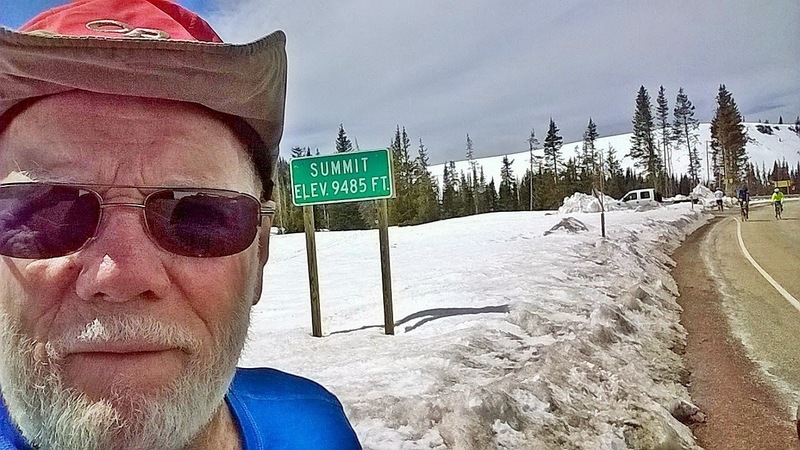 Rather by those dates will pull my trailer up to camp out on Bald Mountain Pass to acclimatize myself, and then hopefully by mid-June be on the trail with my buddy Ted Packard.